I came to China in 1994. At that time it was difficult for western companies to buy directly from Chinese factories. Back then, if you had a trading company, all you had to have to make tons of money is know a couple of mediocre factories. Everybody got very sophisticated and Chinese factories have a lot more to offer in many ways. They have great communication skills, good service, and travel the world and get lots of exposure. Buyers also got more sophisticated. They feel very much at home in China. They know how to manage their relationships with the factories and they feel so confident some of them refuse to work with middlemen. So have trading companies passed from this world? – No! A skilled team of people, continuously present in China that will be their source of information, a channel of communication with the factories and solve problems on their behalf in the production line. This makes many buyers very frustrated. Competition doesn’t leave any room for middlemen, yet this one little details, this China team very few have is something they just have to have. They can send teams of people from HQ to China. This solution works fine if all is needed is a trip to China twice or three times a year. If this is not the case, this solution proves very expensive, the long stays in China prevent the HQ personal from completing their work back home and erode them. A second option is buying from a trading company based in China. This option is perfect for companies that are not sure during the pre-production stage if they will ever manufacture their product. That’s because usually many of the pre-production costs are paid by trading companies. The disadvantage of this option is that although trading companies added value decreases over time, buyers will pay their markup for as long as they buy from the factory introduced by the trading company, and competition doesn't leave room for long supply chains.In addition, traders have to set up systems that will prevent their buyers from bypassing them. First of all, those systems cost money. Second, because the buyer cannot communicate directly with the factory, communication lines are getting longer and inefficient. This creates mistakes and delays, that inevitably raise costs. The third option for western buyers to register a Chinese company and set up a local office, hiring full-time staff to do everything in-house. This option works really well if the amount of business justifies the investment. However, it makes the HQ deals with a whole new set of issues that come down to high fix cost, variable cost that is difficult to control and a very high time investment managing this new team. and the world where they have a qualified and skilled team that supports them, without increasing their costs and risk. We support them when they need our support, and when they don’t – we support other clients. In this way, they don’t pay when they don’t need us, and on top of that, they don’t have to take care of all any admin, HR, Tax etc. they would have had to deal with, had they had their own office in China. We source factories, audit them, run quality control inspections, follow up production order…nothing new here. Our office does not work for one company. It works for many companies – Our customers. We sell “time”. We price our service according to the number of days we need to invest in carrying out a task. and the same time is a fraction of the cost of our customers second-best alternative. This service is suitable for companies that are considering or considered in the past opening their own office in China – big or small. 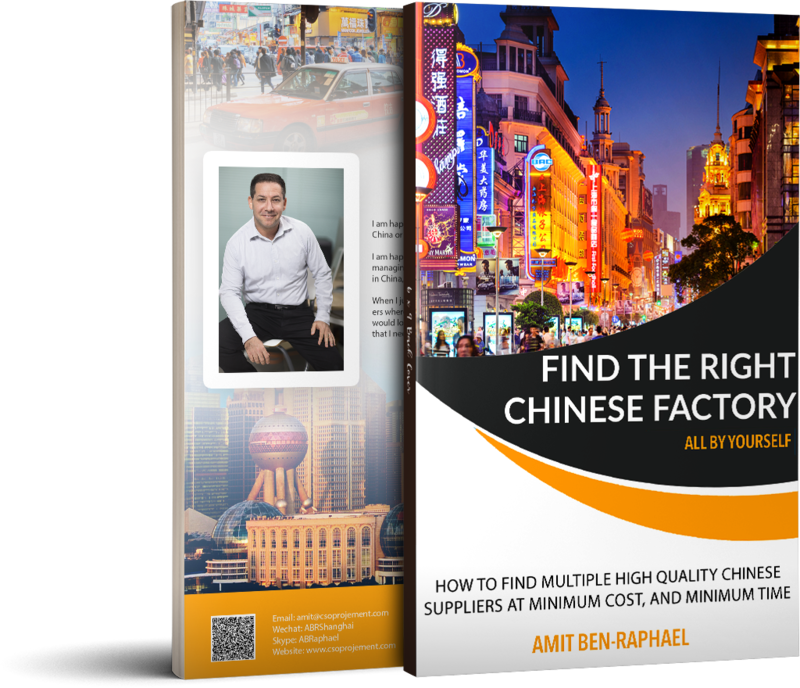 It is suitable for companies that are currently manufacturing their products in China and would like to reduce their cost, increase their control over their production and quality or solve related issues. This service is suitable for companies that are certain about the continuity of their production; that must continue producing their products and because of this are willing to make a small investment in the form of buying our services. Our customers approach us when they have a real need, and this is why they are happy to accept our support. we designed this service for SME’s that have little or no presence in China. We offer a professional and experienced team with an extensive local knowledge that helps companies sustain a robust supplier portfolio and supply chain. We designed this service keeping in mind production in China is a complex project that exposes many of our customers to big risks. This service minimizes those risks, while remaining affordable. so we offer the best. We are selling our time, knowledge and expertise. We quantify what we sell by the time it takes us to deliver the tasks we carry out on behalf of our customers. We use the units “days”. We are selling packages of 10 or 20 “days” per month at USD 500 per day. Although the “days” are based on the capacity of one engineer, our customers get the support of the entire office. Our model is “Days + Expenses” - primarily traveling expenses. Expenses amount fluctuates significantly depending on the location of the factories and the length of stay in the factory. We do that to make sure we offer our customers the best price we can while making the expenses part of the cost transparent, so our customers can make decisions together with us and reduce their costs. We offer our sales partners an average commission of 10% on all income for “days” sold. Some customers are not ready to sign a long-term agreement from the very beginning. This is why we have a few introductory services to allow them to get a feel for our service and experience working with us before they make a longer-term commitment.